Allows the adding of products while viewing the storefront. •Great for a quick add of a product. •Interactive: Helps one see the product as it is developed on the store. 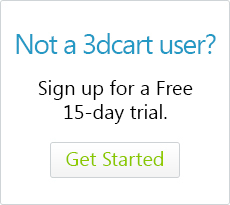 •Great for users who are brand new to 3dcart. Adding products directly from the Online Store Manager. •Better suited for fine tuning. •Great for both beginners and users more familiarized with 3dcart. Using a populated .csv text files to import and add products to your store. •Excellent for adding, removing or updating product information en masse. •Greater potential for end-user error. The Following Knowledge Base Articles will give you information available for each of these methods. Not seeing the Admin Quick Design Bar? Having trouble adding products with the Admin Quick Design Bar? As mentioned, the CSV product import is the fastest and best suited option for adding products to large stores. However, it will can require a bit of a learning curve. Therefore, a good practice is to first create a small handful of products directly from the Online Store Manager. Then, export your created products from the store. This way, you are able to see your exported items in spreadsheet form and better correlate the columns with their specified attributes.